Lots of spectators on Friday at the Volvik Championship practice range. Most news coverage photos of golf tournaments are all the same: tight shots of players swinging, putting, or waving at the crowd. 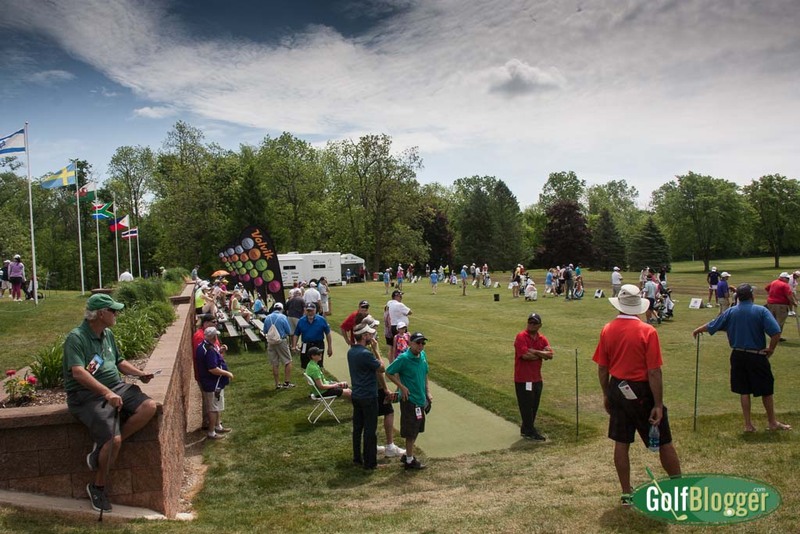 I decided to be a contrarian, and walk around the course to record things that are a part of the Volvik Championship spectator’s experience, but that don’t necessarily make it into news coverage. I did break my own rule and get some photos of players on the course, but that was mostly to remind myself who I followed and watched. The LPGA Volvik Championship is well organized, and very friendly for spectators. Transportation to and from the parking is a very convenient. There are plenty of places to get food and drink, good restroom facilities and shade trees in a lot of good viewing locations. You’ll want to bring a chair, though. There are no general grandstands and you may want to spend some time just sitting and watching. And then there are the things you either don’t see, or for which you only see the end result: acquisition of sponsors, pro-am parties; advertising; media rooms; locker rooms, the LPGA temporary offices, television trucks, storage areas, off-site provisions, websites and more things than I can list. Hats off to the Volvik Championship organizers. Click on any of the photos to embiggen. Spectators are shuttled in University of Michigan buses to and from the parking lot at the nearby Washtenaw County Fairgrounds. Very efficient. The putting green is in a central part of the layout. Watching on the first tee on Friday morning. Many of the concession stands around the course benefit local charities. Homes along the fairways of Travis Pointe are getting into the international spirit of the LPGA. The bag of Sun Young Yoo. The third at Travis Pointe. The group on the green is Dani Holmqvist, Azahara Munoz and Ashlan Ramsey. Memorial Day flags along the fairway of the fourth hole. Marina Alex, Anne Park and Sun Young Yoo walking down the fairway of the fourth at the Volvik Championship. Local dealerships, such as Dunning Subaru, had cars on display around the course. Dani HOlmqvist, Azahara Munoz and Ashlan Ramsey trek to the seventh green. Dani Holmqvist sinks a long putt on the seventh. Schupan recycling cans are all over the course. One of the things that has always struck me about golf tournaments is that — unlike other sporting events — people pick up after themselves. Each hole at the tournament has a sign giving the yardage and a qolf quote. Azahara Munoz. At the end of the second round she was -6 and in a tie for eighth. The par five ninth. The pavilion just off the green is the DTE Energy pavilion for active and retired military and their guests. A small crowd assembles on Friday morning around the ninth green. The flagstick on the ninth green features an American flag. Concession stand near the 19th green. Golfzon, a golf simulator company, is one of several merchants at the Championship. The tenth at The Volvik Championship. Ai Miyazato had a sizable contingent of fans following her. Umbrellas against the sun are a popular course accessory. Wildflowers off the eleventh fairway at the Volvik Championship. Part of Ai Miyazato's entourage. At this point, he's filming her shot out of a bunker. Angela Stanford on the thirteenth fairway. After two rounds, Stanford is -3 and tied for eighteenth. Belin Mozo on the sixteenth tee. At the end of the second round, Mozo was -4 and tied for 18th. One of many Golf Channel towers. These "sold" signs had me puzzling until I realized that they're sponsored by a local real estate company. Fans gathering on Friday morning near the sixteenth green. A view of the eighteenth green. Ruth's Chris Steak house has a concession area. Christina Kim led after the first round with a -8, and after two is -9 and tied for second. The scoring tent just off the eighteenth green.